In early June, at the time of the hay-harvest, these handsome flowers, which look like clusters of little blue lilies, begin to appear among the dried grass of the hillsides and in open places in the woods. They vary in height from a few inches to over a foot and the number of flowers in a cluster also varies very much. Sometimes there are as many as ten of the beautiful blossoms, an inch or more long, with pedicels unequal in length and from one to four inches long, in a large cluster at the top of the stalk, with several, whitish, papery bracts at the base of the cluster. The color of the flowers is usually a deep bright blue shading to violet and the six divisions grow paler toward the base and have a brown stripe on the outside; the buds are greenish, striped with brown. The stamens are translucent white, three ordinary stamens, with long erect anthers, alternating with three without anthers, the latter tongue-shaped and petal-like. The leaves, which are thickish and about the same length as the stalk, have withered away before the flowers bloom. This plant very much resembles Ithuriel's Spear, Triteleia laxa, but three of the stamens are without anthers and the ovary is not on a long stalk. It is the commonest kind around San Francisco. B. minor is much the same, but a smaller plant with fewer and smaller flowers. The three outer divisions are narrow, with pointed tips, and the inner blunt and broad, and the sterile stamens are notched and longer than the fertile ones. This grows on dry hills and plains in middle and southern California. 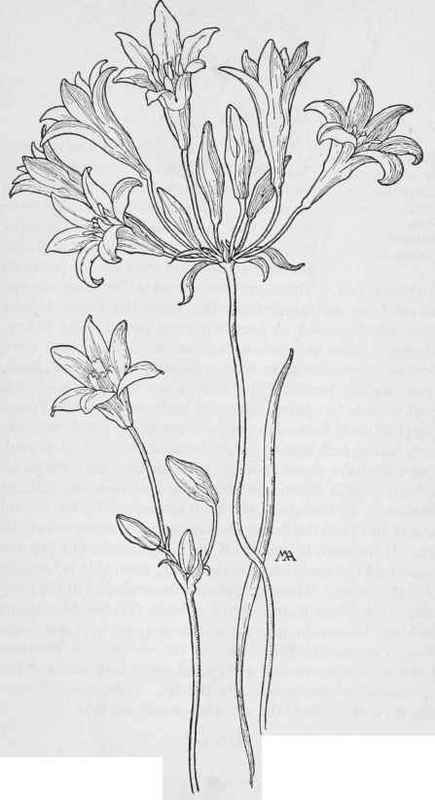 Brodiaea minor. Harvest Brodiaea B.grandiflora. LILY FAMILY. Liliaceae.